Italian painter, draftsman, sculptor, architect, and engineer whose genius, perhaps more than that of any figure, epitomized the Renaissance humanist ideal. His "Last Supper" (1495-97) and "Mona Lisa" (1503-06) are among the most widely popular and influential paintings of the Renaissance. His notebooks reveal a spirit of scientific inquiry and a mechanical inventiveness that were centuries ahead of their time. The unique fame that Leonardo enjoyed in his lifetime and that, filtered and purified by historical criticism, has remained undimmed to the present day is based on the equally unique universality of his spirit. Leonardo's universality is more than many-sidedness. True, at the time of the Renaissance and the period of humanism, many-sidedness was a highly esteemed quality; but it was by no means rare. Many other good artists possessed it. Leonardo's universality, on the other hand, was a spiritual force, peculiarly his own, that generated in him an unlimited desire for knowledge and guided his thinking and behaviour. An artist by disposition and endowment, he found that his eyes were his main avenue to knowledge; to Leonardo, sight was man's highest sense organ because sight alone conveyed the facts of experience immediately, correctly, and with certainty. Hence, every phenomenon perceived became an object of knowledge. Saper vedere ("knowing how to see") became the great theme of his studies of man's works and nature's creations. His creativity reached out into every realm in which graphic representation is used: he was painter, sculptor, architect, and engineer. But he went even beyond that. His superb intellect, his unusual powers of observation, and his mastery of the art of drawing led him to the study of nature itself, which he pursued with method and penetrating logic--and in which his art and his science were equally revealed. The illegitimate son of Ser Piero, a Florentine notary and landlord, Leonardo was born on his father's family estate. His mother, Caterina, was a young peasant woman who shortly thereafter married an artisan from that region. Not until his third and fourth marriages did Ser Piero's wives have children, the first one in 1476, when Leonardo was already an adult. Thus, Leonardo grew up in his father's house, where he was treated as a legitimate son and received the usual elementary education of that day: reading, writing, and arithmetic. As for Latin, the key language of traditional learning, Leonardo did not seriously study it until much later, when he acquired a working knowledge of it on his own. Not until he was 30 years old did he apply himself to higher mathematics--advanced geometry and arithmetic--which he studied with diligent tenacity; but here, too, he did not get much beyond the beginning stages. Leonardo's artistic inclinations must have appeared early. When he was about 15, his father, who enjoyed a high reputation in the Florence community, apprenticed him to Andrea del Verrocchio. In Verrocchio's renowned workshop Leonardo received a many-sided training that included not only painting and sculpture but the technical-mechanical arts as well. He also worked in the next-door workshop of Antonio Pollaiuolo, where he was probably first drawn to the study of anatomy. In 1472 Leonardo was accepted in the painters' guild of Florence but remained five years more in his teacher's workshop. Then he worked independently in Florence until 1481. In the few extant works of this early period one may clearly trace the development of the artist's remarkable talent. Keenness of observation and creative imagination stand out. His early mastery is revealed in an angel and a segment of landscape executed by him in Verrocchio's painting the "Baptism of Christ" (Uffizi, Florence) and in two Annunciations (Uffizi, as well as the Louvre, Paris), both of them done in Verrocchio's workshop, as were the "Madonna with the Carnation," the "Madonna Benois," and the "Portrait of Ginevra de' Benci." This mastery reached its peak in two paintings that remained unfinished: "St. Jerome" and a large panel painting of "The Adoration of the Magi." In addition to these few paintings there are a great many superb pen and pencil drawings, in which Leonardo's mastery blazed new trails for this graphic art. Among the drawings are many technical sketches--for example, pumps, military weapons, mechanical apparatus--evidence of Leonardo's interest in and knowledge of technical matters at the outset of his career. In 1482 Leonardo entered the service of the Duke of Milan--a surprising step when one realizes that the 30-year-old artist had just received his first substantial commissions from his native city of Florence: the above-mentioned unfinished panel painting of "The Adoration of the Magi" for the monastery of S. Donato a Scopeto (1481) and an altar painting for the St. Bernard Chapel in the Palazzo della Signoria, which was never fulfilled. That he gave up both projects despite the commitments he had undertaken--not even starting on the second named--seems to indicate deeper reasons for his leaving Florence. It may have been that the rather sophisticated spirit of Neoplatonism prevailing in the Florence of the Medici went against the grain of his experience-oriented mind and that the more realistic academic atmosphere of Milan attracted him. Moreover, there was the fascination of Ludovico Sforza's brilliant court and the meaningful projects awaiting him there. Leonardo spent 17 years in Milan, until Ludovico's fall from power in 1499. He was listed in the register of the royal household as pictor et ingeniarius ducalis ("painter and engineer of the duke"). Highly esteemed, Leonardo was constantly kept busy as a painter and sculptor and as a designer of court festivals. He was also frequently consulted as a technical adviser in the fields of architecture, fortifications, and military matters, and he served as a hydraulic and mechanical engineer. In this phase of his life Leonardo's genius unfolded to the full, in all its versatility and creatively powerful artistic and scientific thought, achieving that quality of uniqueness that called forth the awe and astonished admiration of his contemporaries. At the same time, in the boundlessness of the goals he set himself, Leonardo's genius bore the mark of the unattainable so that, if one traces the outlines of his lifework as a whole, one is tempted to call it a grandiose "unfinished symphony." As a painter Leonardo completed only six works in the 17 years in Milan: portraits of Cecilia Gallerani ("Lady with an Ermine") and a musician, an altar painting of "The Virgin of the Rocks" (two versions), a monumental wall painting of the "Last Supper" in the refectory of the monastery of Sta. Maria delle Grazie (1495-97), and the decorative ceiling painting of the Sala delle Asse in the Milan Castello Sforzesco (1498). Three other pictures that, according to old sources, Leonardo was commissioned to do have disappeared or were never done: a "Nativity" said to have belonged to Emperor Maximilian; a "Madonna" that Ludovico Sforza announced as a gift to the Hungarian king Matthias Corvinus; and the portrait of one of Ludovico's mistresses, Lucrezia Crivelli. Also unfinished was a grandiose sculptural project that seems to have been the real reason Leonardo was invited to Milan: a monumental equestrian statue in bronze to be erected in honour of Francesco Sforza, the founder of the Sforza dynasty. Leonardo devoted 12 years--with interruptions--to this task. Many sketches of it exist, the most impressive ones discovered only in the mid-20th century, when two of Leonardo's notebooks came to light again in Madrid. They reveal the sublimity but also the almost unreal boldness of his conception. In 1493 the clay model of the horse was put on open display on the occasion of the marriage of Emperor Maximilian with Bianca Maria Sforza, and preparations were made to cast the colossal figure, which was to be 16 feet (five metres) high--double the size of Verrocchio's equestrian statue of Bartolomeo Colleoni! But, because of the imminent danger of war, the metal, ready to be poured, was used for cannon instead, and so the project came to a halt. Ludovico's fall in 1499 sealed the fate of this abortive undertaking, which was perhaps the grandest concept of a monument in the 15th century. The ravages of war left the clay model a heap of ruins. As a master artist Leonardo maintained an extensive workshop in Milan, employing apprentices and students. The role of most of these associates is unclear. Their activity involves the question of Leonardo's so-called apocryphal works, in which the master collaborated with his assistants. Scholars have been unable to agree in their attributions of these works, which include such paintings as "La Belle Ferronniиre" in the Louvre, the so-called "Lucrezia Crivelli" in the Pinacoteca Ambrosiana, Milan, and the "Madonna Litta" in the Hermitage, St. Petersburg (formerly Leningrad). Among Leonardo's pupils at this time were Giovanni Antonio Boltraffio, Ambrogio de Predis, Bernardino de' Conti, Francesco Napoletano, Andrea Solari, Marco d'Oggiono, and Salai. The Milan years also saw Leonardo's decided turn toward scientific studies. He began to pursue these systematically and with such intensity that they demanded more and more of his time and energy and developed into an independent realm of creative productivity. Within him there arose now a growing need to note and write down in literary form every one of his perceptions and experiences. It is a unique phenomenon in the history of art. Undoubtedly, the several treatises on art that appeared or were made available during those decades provided an external stimulus. Leon Battista Alberti's De re aedificatoria (Ten Books on Architecture) was first printed in 1485; Francesco di Giorgio's treatise on architecture was available in its first manuscript versions, and Leonardo had received a copy from the author as a gift. Moreover, Piero della Francesca in his De prospectiva pingendi ("On Perspective in Painting") had provided for his contemporaries a model text on the theory of perspective. Finally, there was the mathematician Lucas Pacioli, who had become an acquaintance of Leonardo's. In 1494 Pacioli published his Summa de arithmetica geometria proportioni et proportional itа, followed by his Divina proportione ("On Divine Proportion"), for which Leonardo drew figures of symmetrical bodies. In this ambience Leonardo began to nourish the desire to write a theory of art of his own, and there arose in him the far-reaching concept of a "science of painting." Alberti and Piero della Francesca had already offered proof of the mathematical basis of painting in their analysis of the laws of perspective and proportion and thereby buttressed painting's claim to being a science. But Leonardo's claims went much further. Proceeding from the basic conviction that sight is the human being's most unerring sense organ, yielding immediate, accurate, and reliable data of experience, Leonardo--equating "seeing" with "perceiving"--arrived at a bold conclusion: the painter, doubly endowed with subtle powers of perception and the complete ability to pictorialize them, was the prime person qualified to achieve knowledge by observing and to reproduce that knowledge authentically in a pictorial manner. Hence, Leonardo conceived the staggering plan of observing all objects in the visible world, recognizing their form and structure, and pictorially describing them exactly as they are. Thus, drawing became the chief instrument of his didactic method. In the years between 1490 and 1495 the great program of Leonardo the writer (author of treatises) began. In it, four main themes, which were to occupy him for the rest of his life, could be discerned and gradually took shape: a treatise on painting, a treatise on architecture, a book on the elements of mechanics, and a broadly outlined work on human anatomy. His geophysical, botanical, hydrological, and aerological researches also belong to this period and constitute parts of the "visible cosmology" that loomed before Leonardo as a distant goal. Against speculative book knowledge, which he scorned, he set irrefutable facts gained from experience--from saper vedere. All these studies and sketches were written down in Leonardo's notebooks and on individual sheets of paper. Altogether they add up to thousands of closely written pages abundantly illustrated with sketches--the most voluminous literary legacy any painter has ever left behind. Of more than 40 codices mentioned in the older sources--often, of course, rather inaccurately--21 have survived; these in turn sometimes contain notebooks originally separate and now bound together so that 31 in all have been preserved. To these should be added several large bundles of documents: an omnibus volume in the Biblioteca Ambrosiana, Milan, called Codex Atlanticus because of its size, was collected by the sculptor Pompeo Leoni at the end of the 16th century; its sister volume, after a roundabout journey, fell into the possession of the English crown and was placed in the Royal Library, Windsor Castle. Finally there is the Arundel Manuscript (British Museum, MS. 263), which contains a number of Leonardo's fascicles on various themes. It was during his years in Milan that Leonardo began the earliest of these notebooks. He would first make quick sketches of his observations on loose sheets or on tiny paper pads he kept in his belt; then he would arrange them according to theme and enter them in order in the notebook. Surviving are a first collection of material for the painting treatise (MSS. A and B in the Institut de France, Paris), a model book of sketches for sacred and profane architecture (MS. B, Institut de France, Paris), the treatise on elementary theory of mechanics (MS. 8937, Biblioteca Nacional, Madrid), and the first sections of a treatise on the human body (Anatomical MS. B; Windsor Castle, Royal Library). Two special features make Leonardo's notes and sketches unusual: his use of mirror writing and the relationship between word and picture. Leonardo was left-handed; so mirror writing came easily and naturally to him. It should not be looked upon as a secret handwriting. Though somewhat unusual, his script can be read clearly and without difficulty with the help of a mirror--as his contemporaries testified. But the fact that Leonardo used mirror writing throughout, even in his fair copies drawn up with painstaking calligraphy, forces one to conclude that, although he constantly addressed an imaginary reader in his writings, he never felt the need to achieve easy communication by using conventional handwriting. Yet occasional examples of normal handwriting (drafts of letters, notes, and comments to be submitted to third parties) show that Leonardo was completely at home in it. In the overwhelming majority of his notes in mirror writing, therefore, one gets the strong impression of "monologues in writing." Finally, then, his writings must be interpreted as preliminary stages of works destined for eventual publication, which Leonardo never got around to completing. In a sentence in the margin of one of his late anatomy sketches, he implores his followers to see that his works are printed. The second unusual feature in Leonardo's writings is the new function given to illustration vis-а-vis the text. Leonardo strove passionately for a language that was clear yet expressive. The vividness and wealth of his vocabulary were the result of intense self-study and represented a significant contribution to the evolution of scientific prose in the Italian vernacular. On the other hand, in his teaching method Leonardo gave absolute precedence to the illustration over the written word; hence, the drawing does not illustrate the text; rather, the text serves to explain the picture. In formulating his own principle of graphic representation--which he himself called dimostrazione ("demonstrations")--Leonardo was a precursor of modern scientific illustration. Thus, during Leonardo's years in Milan the two "action fields"--the artistic and the scientific--developed and shaped his future creativity. It was a kind of "creative dualism," with mutual encouragement but also mutual pressure from each field. In December 1499 or at the latest January 1500--three months after the victorious entry of the French into Milan--Leonardo left that city in the company of Lucas Pacioli. He stopped first at Mantua, where, in February 1500, he drew a portrait of his hostess, Marchioness Isabella d'Este, and then proceeded to Venice (in March), where the Signoria (governing council) sought his advice on how to ward off a threatened Turkish incursion in Friuli. Leonardo recommended that they prepare to flood the menaced region. From Venice he returned to Florence, where, after a long absence, he was received with acclaim and honoured as a renowned native son. In that same year he was appointed an architectural expert to a committee investigating damages to the foundation and structure of the church of S. Francesco al Monte. A guest of the Servite order in the cloister of SS. Annunziata, Leonardo began there a cartoon for a painting of the "Virgin and Child with St. Anne," the composition of which won admiration from artists and art lovers of the city. He also painted (1501) a "Madonna with the Yarn-Winder," which has survived only in copies and which he probably never finished. Mathematical studies seem to have kept him away from his painting activity much of the time, or so Isabella d'Este, who sought in vain to obtain a painting done by him, was informed by Fra Pietro Nuvolaria, her representative in Florence. Only his omnivorous "appetite for life" can explain Leonardo's decision, in the summer of the following year (1502), to leave Florence and enter the service of Cesare Borgia as "senior military architect and general engineer." Borgia, the notorious son of Pope Alexander VI, had, as commander in chief of the papal army, sought with unexampled ruthlessness to gain control of the Papal States of Romagna and the Marches. Now he was at the peak of his power and, at 27, was undoubtedly the most compelling and at the same time most feared person of his time. Leonardo, twice his age, must have been fascinated by his personality. For 10 months he travelled across the condottiere's territories and surveyed them. In the course of his activity Leonardo sketched some of the city plans and topographical maps that laid the groundwork for modern cartography. At the court of Cesare Borgia, Leonardo also met Niccolт Machiavelli, temporarily stationed there as a political observer for the city of Florence. In the spring of 1503 Leonardo returned to Florence to make an expert survey of a project for diverting the Arno River behind Pisa so that the city, then under siege by the Florentines, would be deprived of access to the sea. The plan proved unworkable, but Leonardo's activity led him to a much more significant theme, one that served peace rather than war; the project, first advanced in the 13th century and now again under consideration, was to build a large canal that would bypass the unnavigable stretch of the Arno and connect Florence by water with the sea. Leonardo developed his ideas in a series of studies; with panoramic views of the river bank, which are also landscape sketches of great artistic charm, and with exact measurements of the terrain, he produced a map in which the route of the canal (with its transit through the mountain pass of Serravalle) was shown. The project, considered time and again in subsequent centuries, was never carried out, but centuries later the express highway from Florence to the sea was built over the exact route Leonardo chose for his canal. That same year (1503), however, Leonardo also received a prized commission: to paint a mural for the Hall of the Five Hundred in Florence's Palazzo Vecchio; a historical scene of monumental proportions . For three years he worked on this "Battle of Anghiari"; like its intended complementary painting, Michelangelo's "Battle of Cascina," it remained unfinished. But the cartoon and the copies showing the main scene of the battle, the fight for the standard, were for a long time, to quote the sculptor Benvenuto Cellini, "the school of the world." These same years saw the portrait of "Mona Lisa" and a painting of a standing "Leda," which was not completed and has survived only in copies. The Florentine period was also, however, a time of intensive scientific study; Leonardo did dissections in the hospital of Sta. Maria Nuova and broadened his anatomical work into a comprehensive study of the structure and function of the human organism. He made systematic observations of the flight of birds, concerning which he planned a treatise. Even his hydrological studies, "on the nature and movement of water," broadened into research on the physical properties of water, especially the laws of currents, which he compared with those pertaining to air. These were also set down in his own collection of data, contained in the so-called Leicester Codex in Holkham Hall, Norfolk, England. Thus, during these years in Florence, Leonardo's productivity was also marked by his "creative dualism." Only sporadically did he work at his paintings. When, in May 1506, Charles d'Amboise, governor of the King of France in Milan, asked and was granted permission by the Signoria in Florence for Leonardo to go for a time to Milan, the artist had no hesitation about accepting the invitation. But what was originally a limited period of time became a permanent move under the stress of political circumstances. Florence let Leonardo go, and the monumental "Battle of Anghiari" remained unfinished. Unsuccessful technical experiments with paints seem to have impelled Leonardo to stop working on the mural. One cannot otherwise explain his abandonment of this great work--great both in conception and in realization. Leonardo spent six years in Milan, interrupted only by a six-month stay in Florence in the winter of 1507-08, where he helped the sculptor Giovanni Francesco Rustici execute his bronze statues for the Florence Baptistery but did not resume work on the "Battle of Anghiari." Honoured and admired by his patrons Charles d'Amboise and King Louis XII, who gave him a yearly stipend of 400 ducats, Leonardo never found his duties onerous. They were limited to advice in architectural matters, tangible evidence of which are plans for a palace-villa for Charles d'Amboise and perhaps also sketches for an oratory for the church of Sta. Maria alla Fontana, which Charles funded. Leonardo also looked into an old project revived by the French governor: the Adda canal that would link Milan with Lake Como by water. In Milan he did very little as a painter: two Madonnas, which he promised the King of France, were never painted. He continued to work on the paintings of the "Virgin and Child with St. Anne" and "Leda," which he had brought with him from Florence, as copies from the Lombard school of that period attest. Again Leonardo gathered pupils around him. With Ambrogio de Predis he completed a second version of "The Virgin of the Rocks" (1508), in the course of which protracted litigation between the purchasers and the artists had a happy ending. Of his older disciples, Bernardino de' Conti and Salai were again in his studio; new pupils came, among them Cesare da Sesto, Giampetrino, Bernardino Luini, and the young nobleman Francesco Melzi, Leonardo's most faithful friend and companion until his death. An important commission in sculpture came his way. Gian Giacomo Trivulzio had returned victoriously to Milan as marshal of the French army and a bitter foe of Ludovico Sforza. He commissioned Leonardo to sculpt his tomb, which was to take the form of an equestrian statue and be placed in the mortuary chapel donated by Trivulzio to the church of S. Nazaro Maggiore. But after years of preparatory work on the monument, for which a number of significant sketches have survived, the Marshal himself gave up the plan in favour of a more modest one; so this undertaking, too, remained unfinished. Leonardo must have felt keenly this second disappointment in his work as a sculptor. Compared with his almost cursory work in art, Leonardo's scientific activity flourished. His studies in anatomy achieved a new dimension in his collaboration with a famous anatomist from Pavia, Marcantonio della Torre. He outlined a plan for an overall work that would include not only exact, detailed reproductions of the human body and its organs but would also include comparative anatomy and the whole field of physiology. He even thought he would finish his anatomical manuscript in the winter of 1510-11. Beyond that, his manuscripts are replete with mathematical, optical, mechanical, geological, and botanical studies that must be understood as data for his "perceptual cosmology." This became increasingly actuated by a central idea: the conviction that force and motion as basic mechanical functions produce all outward forms in organic and inorganic nature and give them their shape and, furthermore, the recognition that these functioning forces operate in accordance with orderly, harmonious laws. In 1513 political events--the temporary ouster of the French from Milan--caused the now 60-year-old Leonardo to move again. At the end of the year he went to Rome, accompanied by his pupils Melzi and Salai as well as by two studio assistants, hoping to find employment there through his patron, Giuliano de' Medici, brother of the new pope Leo X. Giuliano gave him a suite of rooms in his residence, the Belvedere, in the Vatican. He also gave him a considerable monthly stipend, but no large commissions came to him. 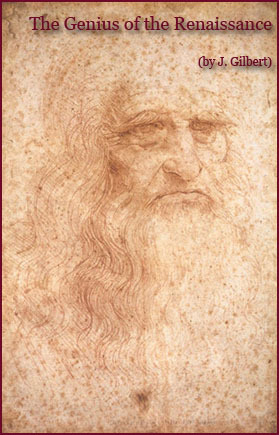 For three years Leonardo remained in the Eternal City, off to one side, while Donato Bramante was building St. Peter's, Raphael was painting the last rooms of the Pope's new apartments, Michelangelo was struggling to complete the tomb of Pope Julius, and many younger artists such as Peruzzi, Timoteo Viti, and Sodoma were active there. Drafts of embittered letters betray the disappointment of the aging master who worked in his studio on mathematical studies and technical experiments or, strolling through the city, surveyed ancient monuments. A magnificently executed map of the Pontine Marshes (Royal Library, Windsor Castle; 12684) suggests that Leonardo was at least a consultant for a reclamation project that Giuliano de' Medici ordered in 1514. On the other hand, there were sketches for a spacious residence for the Medici in Florence, who had returned to power there in 1512. But this did not go beyond the stage of preliminary sketches and never came to pass. Leonardo seems to have resumed his friendship with Bramante, but the latter died in 1514. And there is no record of Leonardo's relations with any other artists in Rome. In a life of such loneliness, it is easy to understand why Leonardo, despite his 65 years, decided to accept the invitation of the young king Francis I to enter his service in France. At the end of 1516 he left Italy forever, together with his most devoted pupil, Francesco Melzi. Leonardo spent the last three years of his life in the small residence of Cloux (later called Clos-Lucй), near the King's summer palace at Amboise on the Loire. Premier peintre, architecte et mйchanicien du Roi ("first painter, architect, and mechanic of the King") was the proud title he bore; yet the admiring King left him complete freedom of action. He did no more painting or at most completed the painting of the enigmatic, mystical "St. John the Baptist," which the Cardinal of Aragon, when he visited Amboise, saw in Leonardo's studio along with the "Mona Lisa" and the "Virgin and Child with St. Anne." For the King he drew up plans for the palace and garden of Romorantin, destined to be the widow's residence of the Queen Mother. But the carefully worked-out project, combining the best features of Italian-French traditions in palace and landscape architecture, had to be halted because the region was threatened with malaria. Leonardo still made sketches for court festivals, but the King treated him in every respect as an honoured guest. Decades later, Francis I talked with the sculptor Benvenuto Cellini about Leonardo in terms of the utmost admiration and esteem. Leonardo spent most of his time arranging and editing his scientific studies. The final drafts for his treatise on painting and a few pages of the anatomy appeared. Consummate drawings such as the "Floating Figure" (Royal Library, Windsor Castle; 12581) are the final testimonials to his undiminished genius. In the so-called "Visions of the End of the World," or "Deluge" (Royal Library, Windsor Castle), he depicts with overpowering pictorial imagination the primal forces that rule nature. Leonardo died at Cloux. He was laid to rest in the palace church of Saint-Florentin. But the church was devastated during the French Revolution and completely torn down at the beginning of the 19th century. Hence, his grave can no longer be located. Francesco Melzi fell heir to his artistic and scientific estate. Leonardo's total output in painting is really not large; only 17 of the paintings that have survived can be definitely attributed to him, and several of them are unfinished. Two of his most important works--the "Battle of Anghiari" and the "Leda," neither of them completed--have only survived in copies. Yet these few creations have established the unique fame of a man whom Vasari, in his Lives, dividing art history into three ages, placed in the last "golden age of the arts." His works, unaffected by all the vicissitudes of aesthetic doctrines in subsequent centuries, have stood out in all periods and all countries as consummate masterpieces of painting. The many testimonials to Leonardo, ranging from Vasari to Peter Paul Rubens, Johann Wolfgang von Goethe, and Eugиne Delacroix, make it unmistakably clear that it has been, above all, Leonardo's art of expression that has called forth the utmost admiration. It is, in fact, the core of his formation as a painter--from his earliest beginnings to his last work. This expression was nurtured by his power of invention but also by every technical means: drawing, colour, use of light and shadow. To Leonardo, expression became a key concept of art; it also included the basic demands of truth, beauty, and accuracy in everything depicted. What Leonardo was striving for was already revealed in his angel in Verrocchio's "Baptism of Christ" (c. 1474-75): in the natural structuring of the angel's body based on movement in several directions, in the relaxation of his attitude, and in his glance, which takes in what is occurring but at the same time is directed inward. In his landscape segment in the same picture, Leonardo also found a new expression for "nature experienced," in reproducing the forms he perceived as if through a veil of mist. The landscape study (Uffizi, Florence) dated 1473, a pen drawing, foreshadows in its treatment of transparent atmosphere by a 21-year-old his telling ability to transform perceived phenomena into convincing graphic forms. In the "Madonna Benois" (1478) Leonardo succeeded in giving an old traditional type of picture a new, unusually charming, and expressive mood by showing the child Jesus reaching for the flower in Mary's hand in a sweet and tender manner. His "Portrait of Ginevra de' Benci" (c. 1475-78) opened new paths for portrait painting with his singular linking of nearness and distance. The emaciated body of his "St. Jerome" (c. 1480) is presented with realistic truth based on his sober and objective studies in anatomy; gesture and look give Jerome an unrivalled expression of transfigured sorrow. The interplay of mimicry and gesture--"physical and spiritual motion," in Leonardo's words--is also the chief concern of his first large creation containing many figures, "The Adoration of the Magi" (1481). Never finished, the painting nevertheless affords rich insight into the master's subtle methods of work. The various aspects of the scene are "built up" from the base with very delicate, paper-thin layers of paint in chiaroscuro (the balance of light and shadow) relief. The main treatment of the Virgin and Child group and the secondary treatment of the surrounding groups are clearly set apart with a masterful sense of composition; yet thematically they are closely interconnected: the bearing and expression of the figures--most striking in the group of praying shepherds--depict all degrees and levels of profound amazement. "The Virgin of the Rocks" in its first version in the Louvre is the work that reveals Leonardo's painting art at its purest. The painting, according to Leonardo's first contract with the Confraternity of the Immaculate Conception, was to be the central panel of a large work for their chapel in the church of S. Francesco and was done in the years c. 1483-85. It never arrived, however, at the place it was originally destined for. It seems to have been prematurely taken from the Confraternity, perhaps by some highly placed interested party who removed it from Leonardo's workshop. Instead of this first painting, Leonardo and Ambrogio de Predis painted a second, slightly revised version, probably begun around 1494. This one gave rise to a 10-year litigation between the artist and the Confraternity regarding the price, a dispute that was not settled until 1506 in favour of Leonardo; whereupon, two years later, the painting was delivered as per contract. This second version remained in the chapel of S. Francesco until the Confraternity was dissolved (1781), and then, after changing owners frequently, it came finally in 1880 to the National Gallery in London. "The Virgin of the Rocks" depicts the apocryphal legend of the meeting in the wilderness between the boy John and the equally young Jesus returning home from Egypt. Leonardo's artistry makes of this theme a vision that the true believer experiences when he contemplates the devotional picture. In the visionary character of the picture lies the secret of its effect: it presents not a "reality" but a "manifestation." Leonardo uses every artistic means at his disposal to emphasize the visionary nature of the scene. The soft colour tones (his famous sfumato), the dim light of the cave from which the figures emerge bathed in light, their quiet attitude, the meaningful gesture with which the angel (the only one facing the viewer) points to John as the intercessor between the Son of God and humanity--all this combines, in a patterned and formal way, to achieve an effect of the highest expressiveness. Leonardo's "Last Supper" is among the most famous paintings in the world. In its monumental simplicity, the composition of the scene is masterful; the power of its effect comes from the striking contrast in the attitudes of the 12 disciples as counterposed to Christ. Leonardo did not choose the portrayal of the traitor Judas customary in the iconographic tradition; he portrayed, rather, that moment of highest tension as related in the New Testament, "One of you which eateth with me will betray me." All of the Apostles--as human beings who do not understand what is about to occur--are agitated, whereas Christ alone, conscious of his divine mission, sits in lonely, transfigured serenity. Only one other being shares the secret knowledge: Judas, who is both part of and yet excluded from the movement of his companions; in this isolation he becomes the second lonely figure--the guilty one--of the company. In the profound conception of his theme, in the perfect yet seemingly simple arrangement of the individuals, in the temperaments of the Apostles highlighted by gesture and mimicry, in the drama and at the same time the sublimity of the treatment, Leonardo attained a height of expression that has remained a model of its kind. Untold painters in succeeding generations, among them great masters such as Rubens and Rembrandt, marvelled at Leonardo's composition and were influenced by it. The painting also inspired some of Goethe's finest pages of descriptive prose. It has become widely known through countless reproductions and prints, the most important being those produced by Raffaello Morghen in 1800. Thus, the "Last Supper" has become part of humanity's common heritage and remains today one of the world's outstanding paintings. Technical deficiencies in the execution of the work have not lessened its fame. Leonardo was uncertain about the technique he should use. He bypassed fresco painting, which, because it is executed on fresh plaster, demands quick and uninterrupted painting, in favour of another technique he had developed: tempera on a base mixed by himself on the stone wall. This procedure proved unsuccessful, inasmuch as the base soon began to be loosened from the wall. Damage appeared by the beginning of the 16th century, and deterioration soon set in. By the middle of the century the work was called a ruin. Later, inadequate attempts at restoration only aggravated the situation, and not until the most modern restoration techniques were applied after World War II was the process of decay halted. In the Florence years between 1500 and 1506, four great creations appeared that confirmed and heightened Leonardo's fame: the "Virgin and Child with St. Anne" (Louvre), "Mona Lisa," "Battle of Anghiari," and "Leda." Even before it was completed, the "Virgin and Child with St. Anne" won the critical acclaim of the Florentines; the monumental plasticity of the group and the calculated effects of dynamism and tension in the composition made it a model that inspired Classicists and Mannerists in equal measure. The "Mona Lisa" became the ideal type of portrait, in which the features and symbolic overtones of the person painted achieved a complete synthesis. The young Raphael sketched the work in progress, and it served as a model for his "Portrait of Maddalena Doni." Similarly, the "Leda" became a model of the figura serpentinata ("sinuous figure")--that is, a figure built up from several intertwining views. It influenced such classical artists as Raphael, who drew it, but it had an equally strong effect on Mannerists such as Jacopo Pontormo. In the "Battle of Anghiari" (1503-06) Leonardo's art of expression reached its high point. The preliminary drawings--many of which have been preserved--reveal Leonardo's lofty conception of the "science of painting"; the laws of equilibrium that he had probed in his studies in mechanics were put to artistic use in this painting. The "centre of gravity" lies in the group of flags fought for by all the horsemen. For a moment the intense and expanding movement of the swirl of riders seems frozen; this passing moment, the transition from one active movement to the next, is uniquely interpreted. On the other hand, Leonardo's studies in anatomy and physiology influenced his representation of human and animal bodies, particularly when they were in a state of excitement. He studied and described extensively the baring of teeth and puffing of lips as signs of animal and human anger. On the painted canvas, rider and horse, their features distorted, are remarkably similar in expression. The highly imaginative trappings take the event out of the sphere of the historical into a timeless realm. Thus, the "Battle of Anghiari" became the standard model for a cavalry battle. Its composition has influenced many painters: from Rubens in the 17th century, who made the most impressive copy of the scene from Leonardo's now-lost cartoon, to Delacroix in the 19th century. After 1507--in Milan, Rome, and France--Leonardo did very little painting. He did resume work on the Leda theme during his years in Milan and sketched a variation, the "Kneeling Leda." The drawings he prepared--revealing examples of his late style--have a curious, enigmatic sensuality. Perhaps in Rome he began the "St. John the Baptist," which he completed in France. Bursting all the boundaries of usual painting tradition, he presented Christ's forerunner as the herald of a mystic oracle; his was an "art of expression" that seemed to strive consciously to bring out the hidden ambiguity of the theme. The last manifestation of Leonardo's art of expression was in his "Visions of the End of the World," a series of pictorial sketches that took the end of the world as its theme. Here Leonardo's power of imagination--born of reason and fantasy--attained its highest level. The immaterial forces in the cosmos, invisible in themselves, appear in the material things they set in motion. What Leonardo had observed in the swirling of water and eddying of air, in the shape of a mountain boulder and in the growth of plants now assumed gigantic shape in cloud formations and rainstorms. The framework of the world splits asunder, but even its destruction occurs--as the monstrously "beautiful" forms of the unleashed elements show--in accordance with the self-same laws of order, harmony, and proportion that presided at its creation and that govern the life and death of every created thing in nature. Without any model, these "visions" are the last and most original expressions of Leonardo's art--an art in which his perception based on saper vedere seems to have come to fruition. That Leonardo worked as a sculptor from his youth on is borne out by his own statements and those of other sources. In the introduction to his Treatise on Painting he gives painting precedence over sculpture in the hierarchy of the arts; yet he emphasizes that he practices both arts equally. A small group of generals' heads in marble and plaster, works of Verrocchio's followers, are sometimes linked with Leonardo because a lovely drawing on the same theme from his hand suggests such a connection. But the inferior quality of this group rules out an attribution to the master. Not a trace has remained of the heads of women and children that, according to Vasari, Leonardo modelled in clay in his youth. The two great sculptural projects to which Leonardo devoted himself wholeheartedly stood under an unlucky star; neither the huge, bronze equestrian statue for Francesco Sforza, on which he worked until 1494, nor the monument for Marshal Trivulzio, on which he was busy in the years 1506-11, were brought to completion. Leonardo kept a detailed diary about his work on the Sforza horse; it came to light with the rediscovery of the Madrid MS. 8936. Text and drawings both show Leonardo's wide experience in the technique of bronze casting but at the same time reveal the almost utopian nature of the project. He wanted to cast the horse in a single piece, but the gigantic dimensions of the steed presented insurmountable technical problems. Indeed, Leonardo remained uncertain of the problem's solution to the very end. The drawings for these two monuments reveal the greatness of Leonardo's concept of sculpture. Exact studies of the anatomy, movement, and proportions of a live horse--Leonardo even seems to have thought of writing a treatise on the horse--preceded the sketches for the monuments. Leonardo pondered the merits of two types, the galloping or trotting horse, and in both cases decided in favour of the latter. These sketches, superior in the suppressed tension of horse and rider to the achievements of Donatello's Gattamelata and Verrocchio's Colleoni sculptures, are among the most beautiful and significant examples of Leonardo's art. Unquestionably--as ideas--they exerted a very strong influence on the development of equestrian statues in the 16th century. A small bronze of a galloping horseman in Budapest is so close to Leonardo's style that, if not from his own hand, it must have been done under his immediate influence (perhaps by Giovanni Francesco Rustici). Rustici, according to Vasari, was Leonardo's zealous student and enjoyed his master's help in sculpting his large group in bronze of "St. John the Baptist Teaching" over the north door of the Baptistery in Florence. There are, indeed, discernible traces of Leonardo's influence in John's stance, with the unusual gesture of his upward pointing hand, and in the figure of the bald-headed Levite. Moreover, an echo of Leonardo's inspiration is unmistakable in the much-discussed and much-reviled wax bust of "Flora" in Berlin. It may have been made in France, perhaps in the circle of Rustici, who entered Francis I's service in 1528. Leonardo, who in a letter to Ludovico Sforza applying for service described himself as an experienced architect, military engineer, and hydraulic engineer, was concerned with architectural matters all his life. But his effectiveness was essentially limited to the role of an adviser. Only once--in the competition for the cupola of the Milan cathedral (1487-90)--did he actually consider personal participation; but he gave up this idea when the model he had submitted was returned to him. In other instances, his claim to being a practicing architect involved sketches for representative secular buildings: for the palace of a Milanese nobleman (around 1490), for the villa of the French governor in Milan (1507-08), and for the Medici residence in Florence (1515). Finally, there was his big project for the palace and garden of Romorantin in France (1517-19). Especially in this last named, Leonardo's pencil sketches clearly reveal his mastery of technical as well as artistic architectural problems; the view in perspective (at Windsor Castle) gives an idea of the magnificence of the site. Leonardo was also quite active as a military engineer, beginning with the years of his stay in Milan. But no definite examples of his work can be adduced. Not until the discovery of the Madrid notebooks was it known that in 1504, sent probably by the Florence governing council, he stood at the side of the Lord of Piombino when the city's fortifications system was repaired and that Leonardo suggested a detailed plan for overhauling it. Finally, his studies for large-scale canal projects in the Arno region and in Lombardy show that he was also an expert in hydraulic engineering. But what really characterizes Leonardo's architectural studies and makes them stand out is their comprehensiveness; they range far afield and embrace every type of building problem of his time. Furthermore, there frequently appears evidence of Leonardo's impulse to teach: he wanted to collect his writings on this theme in a theory of architecture. This treatise on architecture--the initial lines of which are in MS. B (Institut de France, Paris), a model book of the types of sacred and profane buildings--was to deal with the entire field of architecture as well as with the theory of forms and construction and was to include such items as urbanism, sacred and profane building, and a compendium of the important individual elements (for example, domes, steps, portals, and windows). In the fullness and richness of their ideas, Leonardo's architectural studies offer an unusually wide-ranging insight into the architectural achievements of his epoch. Like a seismograph, his observations sensitively register all themes and problems. For almost 20 years he was associated with Bramante at the court of Milan and again met him in Rome in 1513-14; he was closely associated with such other distinguished architects as Francesco di Giorgio, Giuliano da Sangallo, Giovanni Antonio Amadeo, and Luca Fancelli. Thus, he was brought in closest touch with all of the most significant building undertakings of the time. Since Leonardo's architectural drawings extend over his whole life, they span precisely that developmentally crucial period--from the 1480s to the second decade of the 16th century--in which the principles of the classical style were formulated and came to maturity. That this genetic process can be followed in the ideas of one of the greatest men of the period lends Leonardo's studies their distinctive artistic value and their outstanding historical significance. Notwithstanding Leonardo's abundant scientific activity, one must never lose sight of the fact that it was the intellectual output of a man who proudly and consciously felt himself an artist throughout his life. And he described himself as such. He first came in contact with science as an artist, in the task he set himself of writing a treatise on painting. Leonardo's famous book on painting, in the form known and read today, is not an original work by the master but a compilation of texts from various manuscripts by Leonardo, collected and arranged with loving care by his disciple and heir, Francesco Melzi. It is the Codex Urbinas Latinus 1270, now in the Vatican Library. It was prepared around 1540-50, but from its form one can see that it was still an unfinished rather than a completed manuscript. Many original texts known to exist are missing; whole sections of Leonardo's overall plan are not included. The first printed edition of the treatise in Melzi's version, omitting the long introductory chapter concerning the "pecking order" among the arts, appeared in a luxurious binding in 1651 in Paris, published by Raffaelo du Fresne with illustrations after drawings by Nicolas Poussin. The first complete edition of Melzi's text did not appear until 1817, published by Guglielmo Manzi in Rome. The two standard modern editions are that of Emil Ludwig, three volumes, Vienna, 1882 (with German translation); and that of A. Philip McMahon, Princeton, 1956, two volumes (facsimile of the Codex Urbinas and English translation). Leonardo's plan envisaged a much broader treatment of the theme, as his own allusions to it indicate. For, in addition to detailed practical instructions for painting and drawing, the treatise was to deal with every area involving the artist's perception and experience, which he could then convey as acquired criteria. Three main problems form the keynote of the work: the definition of painting as a science, which is briefly outlined above; the theory of the mathematical basis of painting--that is, geometry, perspective, and optics--with the systematic study of light and shadow, colour, and aerial perspective; and the theory of forms and functions in organic and inorganic nature, as they are explained and made comprehensible to the painter trained in saper vedere. This theory of the forms and functions of the visible world sought first of all to describe the animal world, including man; next it sought to include the plant world; finally it endeavoured to explain how such phenomena of inorganic nature as water and earth, air and fire came into being. In the drawings for the Treatise on Painting, extending from the earliest Milan period to the final years of Leonardo's life in France, the progressive broadening and deepening of the theme can be followed. Many drawings were placed by the side of the text, and some of them were coloured; many studies of nature that are admired as art works, such as the famous rain landscape (Windsor Castle; 12409) or the "Foliage" (Royal Library, Windsor Castle; 12431), can be identified as illustrations for the treatise. Manuscript C in the Institut de France, Paris, with its diagrams of the blending of lights and shadows, likewise represents a segment of this textbook. Leonardo's so-called grotesque heads are also closely linked with the treatise. They have often been erroneously described as caricatures; but actually, for the most part, they represent types and only occasionally individuals. They are variations of the human face in its gradations between the poles of the beautiful and ugly, the normal and abnormal, the dignified and vulgar. They are also related to anatomical-physiological studies, in which old age--with wrinkled skin and bulging tendons--is contrasted with youth. Representation of the human being was to be treated at length: his body, his proportions, his organs and their functions but also his attitudes in physical and spiritual movement. Here Leonardo's artistic and scientific aims intertwine. Leonardo's anatomical studies are perhaps the best way of revealing the process by which, in Leonardo's mind, an increasing differentiation set in among his diverse spheres of interest; but it was a differentiation in which the seemingly divergent areas of study--likewise on a higher level--always remained interrelated. Thus, Leonardo's study of anatomy, originally pursued for his training as an artist, quickly grew into an independent area of research. As his sharp eye uncovered the structure of the human body, Leonardo became fascinated by the figura istrumentale dell' omo ("man's instrumental figure"), and he sought to probe it and present it as a creation of nature. The early studies dealt chiefly with the skeleton and muscles; yet even at the outset Leonardo combined anatomical with physiological researches. From observing the static structure, Leonardo proceeded to study the functions exercised by the individual parts of the body as they bring into play the organism's mechanical activity. This led him finally to the study of the internal organs; among them he probed most deeply into the brain, heart, and lungs as the "motors" of the senses and of life. He did practical work in anatomy on the dissection table in Milan, then in the hospital of Sta. Maria Nuova in Florence, and again in Milan and Pavia, where he received counsel and inspiration from the physician-anatomist Marcantonio della Torre. By his own admission he dissected 30 corpses in his lifetime, thus acquiring an astonishing range of experience on his own. This experience was distilled in the famous anatomical drawings, which are among the most significant achievements of Renaissance science. These drawings, among his dimostrazione, are based on a curious connection between natural and abstract representation; sections in perspective, reproduction of muscles as "strings" or the indication of hidden parts by dotted lines, and finally a specifically devised hatching system enable him to represent any part of the body in transparent layers that afford an "insight" into the organ. Here Leonardo's mastery of drawing proved most useful. The genuine value of these dimostrazione and their superiority to descriptive words--as Leonardo proudly emphasized--lay in the fact that they were able to synthesize a multiplicity of individual experiences at the dissecting table and make the data immediately and accurately visible. The effect is unlike that of all dead anatomical preparations; in this way the "live quality" of the organism is retained. This great picture chart of the human body was what Leonardo envisaged as a cosmografia del minor mondo ("cosmography of the microcosm"). From the advanced portions that have survived, it is apparent how much and how long it occupied his mind. And it provided the basic principles for modern scientific illustration. Leonardo has not sufficiently received his due in this domain. Thanks to a method of seeing that was peculiarly his own, he elevated the art of drawing into a means of scientific investigation and teaching of the highest quality. With Leonardo, mechanics also proceeds from artistic practice, with which he became quite familiar as an architect and engineer. Throughout his life Leonardo was an inventive builder; he was thoroughly at home in the principles of mechanics of his epoch and contributed in many ways to advancing them. His model book on the elementary theory of mechanics, which appeared in Milan at the end of the 1490s, was discovered in the Madrid Codex 8937. Its importance lay less in its description of specific machines or work tools than in its use of demonstration models to explain the basic mechanical principles and functions employed in building machinery. Leonardo was especially concerned with problems of friction and resistance. These elements--screw threads, gears, hydraulic jacks, swivelling devices, transmission gears, and the like--are described individually or in various combinations; and here, too, drawing takes precedence over the written word. As in his anatomical drawings, Leonardo develops definite principles of graphic representation--stylization, patterns, and diagrams--that guarantee a precise demonstration of the object in question. See to it that the book of the principles of mechanics precedes the book of force and movement of man and the other living creatures, for only in that way will you be able to prove your statements. So, finally, "force" became the key concept for Leonardo; as virtщ spirituale ("spiritual property"), it shaped and ruled the cosmos. Wherever Leonardo probed the phenomena of nature, he recognized the existence of primal mechanical forces that govern the shape and function of the universe: in his studies on the flight of birds, in which his youthful idea of the feasibility of a flying apparatus took shape and led to exhaustive research into the element of air; in his studies of water, the vetturale della natura ("conveyor of nature"), in which he was as much concerned with the physical properties of water as with its laws of motion and currents; in his researches on the laws of growth of plants and trees as well as the geological structure of earth and hill formations; and finally in his observation of air currents, which evoked the image of the flame of a candle or the picture of a wisp of cloud and smoke. In his drawings, especially in his studies of whirlpools, based on numerous experiments he undertook, Leonardo again found a stylized form of representation that was uniquely his own: this involved breaking down a phenomenon into its component parts--the traces of water or eddies of the whirlpool--yet at the same time preserving the total picture, analytic and synthetic vision. Thus, for all the separate individual realms of his knowledge, Leonardo's science offered a unified picture of the world: a cosmogony based on saper vedere. Its final wisdom is that all the workings of nature are subject to a law of necessity and a law of order that the Primo Motore, the divine "Prime Mover," created. "Marvelous is Thy justice, O Prime Mover! Thou hast seen to it that no power lacks the order and value of your necessary governance." As the 15th century expired, Scholastic doctrines were in decline, and humanistic scholarship was on the rise. Leonardo, however, was part of an intellectual circle that developed a third, specifically modern form of cognition. In his view the artist--as transmitter of the true and accurate data of experience acquired by visual observation--played a significant part. With this sense of the artist's high calling, Leonardo approached the vast realm of nature to probe its secrets. His utopian idea of transmitting in encyclopaedic form the knowledge thus won was still bound up with medieval Scholastic conceptions, but the results of his research were among the first great achievements of the thinking of the new age because they were based on the principle of experience in an absolutely new way and to an unprecedented degree. Finally, Leonardo, although he made strenuous efforts to teach himself and become erudite in languages, natural science, mathematics, philosophy, and history, as a mere listing of the wide-ranging contents of his library demonstrates, remained an empiricist of visual observation. But precisely here--thanks to his genius--he developed his own "theory of knowledge," unique in its kind, in which art and science form a synthesis. In the face of the overall achievements of Leonardo's creative genius, the question of how much he finished or did not finish becomes pointless. The crux of the matter is his intellectual force--self-contained and inherent in every one of his creations. This force has remained constantly operative to the present day. "The Annunciation" (c. 1472-77; Uffizi, Florence); "The Annunciation" (c. 1472-77; Louvre, Paris); "Madonna with the Carnation" (c. 1474; Alte Pinakothek, Munich); "Portrait of Ginevra de' Benci" (c. 1475-78; National Gallery of Art, Washington, D.C.); "Madonna Benois" (1478-after 1500; Hermitage, St. Petersburg); "St. Jerome" (c. 1480; Vatican Museums, Rome); "The Adoration of the Magi" (1481; Uffizi); "The Virgin of the Rocks" (c. 1483-85; Louvre); "The Musician" (c. 1490; Pinacoteca Ambrosiana, Milan); "Lady with an Ermine" ("Cecilia Gallerani"; c. 1490; Muzeum Narodowe, Krakуw, Poland); "The Virgin of the Rocks" (1494-1508; National Gallery, London); "Last Supper" (1495-97; Sta. Maria delle Grazie, Milan); decoration of the Sala delle Asse (1498; Castello Sforzesco, Milan); "The Virgin and Child with St. Anne" (cartoon, c. 1499; National Gallery); "Virgin and Child with St. Anne" (c. 1501-12; Louvre); "Mona Lisa" ("La Gioconda"; 1503-06; Louvre); "St. John the Baptist" (before 1517; Louvre). Lost: "Madonna with the Yarn-Winder" (1501; best copy in the Duke of Buccleuch Collection, Boughton, Kettering); "Leda" (1503-06; best copy at Galleria Borghese, Rome); "Battle of Anghiari" (1503-06; copy at Palazzo Vecchio, Florence).